"Great consideration for one another – that’s what’s going to save the world…"
“Great consideration for one another – that’s what’s going to save the world”said the late June Callwood in her last interview. This morning I finished listening to an episode of the CBC‘s The Best of Ideas podcast on my way to work. It was a lecture given by June Callwood in 2002, replayed as a tribute to her, since she passed away on April 14. 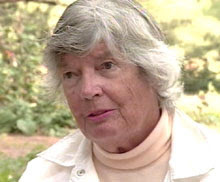 June Callwood was a well-noted, much acclaimed journalist and interviewer, for which she has received many awards and recognitions. What I find most inspiring about Callwood though, is not her awards, but her tireless efforts on behalf of some of Canada’s most vulnerable: the poor, the homeless, women, children. Callwood never ceased to work to make the world a better place, and she never gave up hope either. She always faced injustice head-on, and never seemed to hesitate to tell people the truth, even if it was harsh. She was bold, courageous, and hard-hitting. She founded shelters and hospices. She was a founding member of the Canadian Civil Liberties Union. And she believed in people. That, I think, is what amazes me the most about her. In what I’ve read by her and about her, the interviews I read, seen and heard, through all of it she still believes in the value of every single person and believes that together, through simple acts, we can transform the world. I have deep respect for people like June Callwood who speak and act boldly in their lives. Listening to her speak while I was on the train this morning, I nearly cried, because what she said was so powerful and honest, and because we as Canadians have lost an important, treasured voice. I hope that I can learn how to write, speak, and act boldly. I hope we all learn much from the wisdom of June Callwood. I love to cook. I love trying new recipes, I love inventing new recipes, I love looking at a bunch of ingredients and coming up with ideas of how they could be used together. I especially love cooking for other people, spreading out a bunch of food on a table and watching people I care about smile and listen to them make yummy noises. Tonight I cooked-up a pan of roasted vegetables and leftover ham for myself, seasoned with some of my favourite herbs and spices, like rosemary and garlic (I can smell the rosemary and garlic on my fingers as I type this). Yes, that’s a picture of my dinner sitting next to my computer. I think if I were to analyze what I love so much about cooking, I would have to say that there are multiple reasons. A major one is the sensuousness of the whole process. I am a big smell-taste-touch person, if I had to pick a favourite sense, it would be touch, taste and smell would be tied for second place. Another reason is the creativity involved, and as with any art, the more I learn, the bolder and more interesting my cooking becomes. Like today, I put allspice in my spice mixture, which was a bold move, but one that produced beautiful results, and stemmed from what I’ve learned from Indian and Mexican recipes. The third main reason (there are so many, I won’t talk about them all here) is the relational aspect – cooking is more fun when I’m cooking for people that I love and care about, because food is something we all need anyway, so I’m happy to help provide them with sustenance. And cooking is even more fun when I do it with people I love – I love the teamwork that goes on in a kitchen, with everyone pitching in, adding their wisdom, and having great conversation too. Doing theology, for me, is a lot like cooking. My theology a sensory matter in that it is most often rooted in my own bodily, lived experiences. My theology gets better and bolder the more that I learn, and exotic sources are extremely fruitful places for learning. And my theology is best when I have a community with which I can play and learn and work. The last class is done, and now it is time to buckle down and write final papers. I am cursed by the demon of procrastination, and it is made worse by the fact that for the program I’m in, next week is the official due date not for work from this semester’s classes, but for classes from the fall semester. I wish I hadn’t left the work this late… but I did, and now I must deal with it. As of this coming September, this grotesque delayed-deadline phenomenon will end, since, thankfully, the school is changing its policy. I am an immediate-motivation type of girl, if there is no actual drop-dead-type deadline looming over me, I just won’t do the work. So now I have a mountain of books, most of which I really have read, that I have to write about. It’s for my own benefit, these will be important ingredients in the stew of my thesis, but that doesn’t mean I can’t complain about it. This year I did something new and bought real art with birthday money as a gift to myself. What I bought is the piece you see here. It’s entitled “Enjoy the Silence” and is by Melissa Voth McHugh. It is a piece that called out to me as soon as I saw it. For several years now I’ve told a number of people that my personal Easter icon is a green plant pushing its way through pavement: a sign that life triumphs and is unstoppable in it’s victory. So when I saw this painting, I knew that this was it: the Easter icon I’d been desiring. Easter is perhaps the most difficult Christian event to unpack and attempt to view constructively. Each year I find myself searching for new meaning, trying to find some way to understand this event, so crucial (see crux/crucifix in my choice of language there) to our Christian faith, an “anchor” in our stormy history. Always unbelievable. Always unreasonable. Always illogical. Hopefully it always will be. I find myself wondering what keeps me from pushing through the pavement of selfishness, need, judgementalism, self-centeredness, when there is light and air and water beckoning me out of the darkness of self and into the infinity of divine glory. Why was it that I seemed to be happier in the darkness of good Friday this year, bound into the passion? Why don’t I do more, help more, give more? Hmmm, and then I think of the tomato seedlings crowded onto my living-room windowsills. I am willing to make room for them. I believe in seeds taking root and pushing through the soil. I do believe in life. I do believe in the scandalousness of grace, that what I do is enough. I do believe in resurrection. Not because it is logical or sane or academically-provable, but because it is irrational, unreasonable and exactly the kind of thing that the God I believe in, whose passion streams unceasingly, would do. For good Friday in my home congregation this year we had a healing service. I’d never thought about the idea of having a healing service at that point in holy week, but in thinking about it, I found it makes a lot of sense. I think we all find ourselves wounded by passion – most obvious in the week containing what we call Christ’s passion. What is this word, passion, “something forceful that comes from within and exceeds and overruns you”? I recently read an incredible essay entitled “Passion-Binding-Passion” that played with notions of how we play with passion, submission, and subject/ivity in our spiritual practice. What is it that binds us to God, to one another? Is it pleasant, painless, easy, simple? I don’t think so. Sometimes it’s uncomfortable, painful, difficult, complex. What is it that keeps me in a faith community that is not always a comfortable fit, that sometimes rubs me the wrong way? What keeps me at a school that sometimes feels like it squelches more than gives life? What is it that keeps one loving people who are difficult to love? Streaming passion that cannot be contained. Passion, com/passion, is what I could feel in the room when we had our healing service on Friday night. I was filled with love for the people who were gathered there and a deep feeling of wanting to pour out that passion, and to offer ministry and healing. We had prepared the space intentionally with multiple stations for meditation, one for intercessory prayer, one for healing touch, and one for administration (a sacrament of anointing and laying-on of hands). We also taped a labyrinth onto the floor, and I enjoyed the journeys I took in and out of it, going deeper into a relational space, and surrendering myself more and more to the work that God was calling me to do that night. “Holy Week” (the week before Easter in the Christian liturgical calendar) came upon me by surprise this year. I didn’t even realize it was happening until Monday. This statement is revealing and incriminates me for my non-attendance at a regular church service Sunday morning (where I could have experienced “Palm Sunday” and therefore known that I was on the doorstep of Holy week). I kind of like that it came upon me by surprise though, it reminds me of the time my sister and I read the gospel of Mark aloud to each other, all the way through. It was my first year at seminary and I needed to read Mark and thought it would be a fun exercise. It was actually an interesting experience. I still remember how struck I was, as the story began to unfold in the final chapters, by the injustice of what I knew was about to happen. I got caught up in the story’s rhetoric, it grabbed my heartstrings, and I found myself wanting to yell at the characters “No! Don’t do it! Don’t let the story go this way! I know where this path leads and it’s not a happy ending!” Just like a horror movie where I as the audience know what lies behind the door that is just about to be opened. This is how I feel about holy week, it came upon me so suddenly that I want to resist it, I don’t want it to go this way… and yet I am also strangely desirous of its unfolding. I am learning to let go and let myself fall into a timing in life that is not entirely my own. “Things are unfolding in God’s time,” I wrote in my journal yesterday, “and I’m learning to trust that unfolding.” There are pieces of my life that have needed to speed-up, and pieces that have needed to slow down. On the morning of Palm Sunday I taught a class at a church young adult event. The class was called “Homosexuality and the Bible: Opportunities for Responsible Exegesis”, I had agreed to teach it not necessarily because I felt like I could, but because I didn’t want someone else teaching it. The class turned out so well that now I feel like it was a confirmation that I am in the right place, doing the right things, at the right time. The path of theological academia is the path that is right for me right now, and I trust that I will be called into places and times where the work I do can give life to others. I am excited to see what the rest of Holy Week will be. I trust that it will unfold at a divine pace, and I trust that it will hold surprises for me, just as I trust that my life will unfold in the fullness of time and hold many exciting surprises for me.